How to Grow an Avocado Tree - AvoSeedo - Grow your own Avocado Tree! After a long winter the season of sun bathing, flowers blooming, and avocado seeds germinating is finally here. Avocados are summer fruits that are full of flavor and rich in nutrients. Now is the best time of the year for beginning an avocado tree! The key to a successful germination, though, comes from first knowing what steps will lead you there. 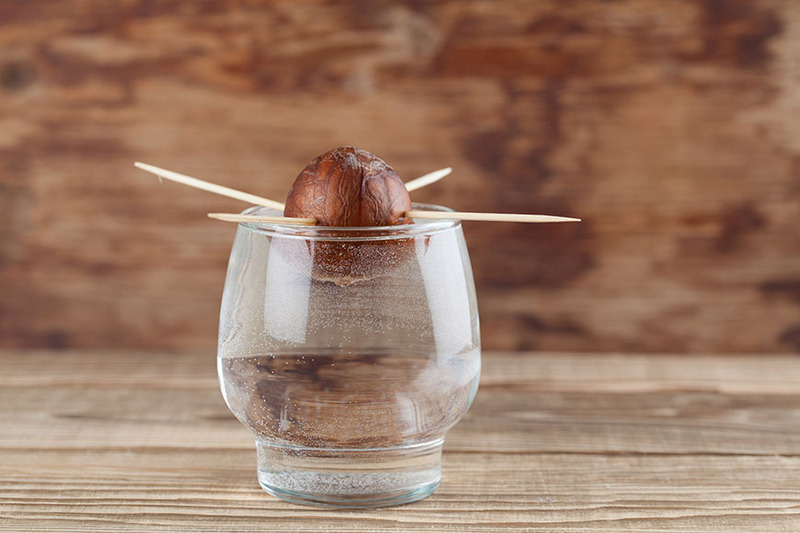 Read below to learn how the transformation your avocado seed to an avocado tree will work. Cut the avocado in half and remove the pit. Rinse the pit with cool water and blot it dry with a paper towel. You can carefully peel the pit for faster germination. Before placing the toothpicks into the seed you’ll want to locate the “top” and bottom” of the seed. The top, or more pointed area, is where your seed will sprout. The bottom, or more flat area, is where the roots will grow from. Gently but firmly, push three to four toothpicks into the thickest width of avocado until you feel they are stable. Carefully pour water into the cup, but just enough so that only half the seed will be submerged. Place the seed over a cup of water narrow enough to hold the toothpicks in place. Only the bottom half of the seed should be touching water. Adjust water levels as needed. Place the cup in a window where it’ll receive plenty of sunshine and let photosynthesis take its course! To prevent any mold forming be sure to change your water every week or so. Keep in mind that it’ll take about three to eight weeks before you can expect to see any sprouting. Patience during this period is key! Roots will begin to grow at the base and a stem sprout will emerge from the top. Once a sprout appears and reaches 6 inches then you’re ready to transfer it to a soiled pot or put it directly into the Earth. Don’t forget to gently remove the toothpicks before you do this! Avocado trees do well with soil that is low in saline and has much drainage. A 50/50 blend of topsoil and coir works well for these trees. The soil won’t need to be heavily fertilized until you’ve had your tree for a year. When the time arrives use a 10-10-10 fertilizer twice a year for the tree’s benefit. If you decide you want to your tree to grow from the ground then ensure the temperature never drops below 50 º F. Otherwise, keep it in a pot so that you can move your tree inside when necessary. Water your tree enough so that the soil is always moist, but not saturated. Once your plant has reached 12 inches, you can pinch off the top two sets of leaves. Doing this will make the plant grow shoots from the side which will aid in even more leaves. You can repeat this for every 6 inches of growth. 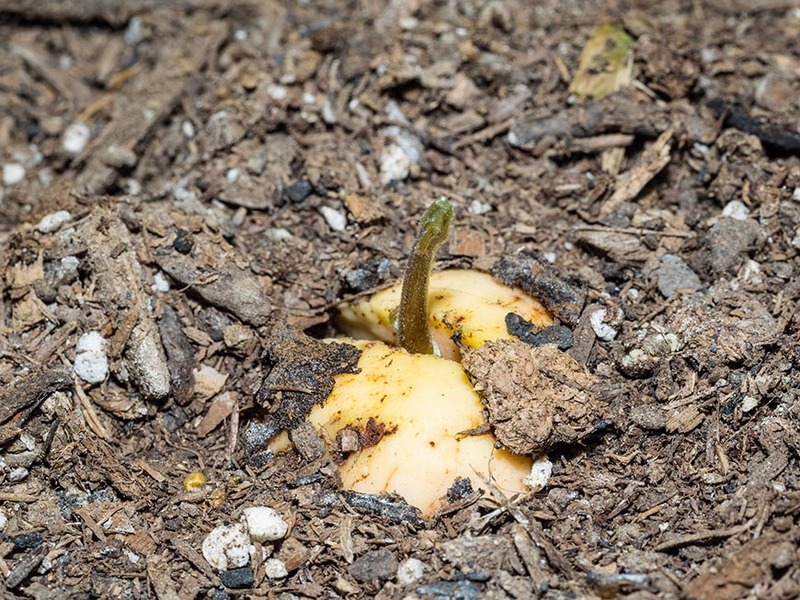 After removing and cleaning the pit, fill a plant pot with soil or compost and gently press your avocado seed in, until it is about halfway covered then water until moist. Check the soil every few days to see if it needs more water. After two to eight weeks a sprout will come out and a thick little root will be pushing down into the soil. You can put your plant outside if the weather is good. Wrap the cleaned avocado pit in a damp paper towel. Place it in a dish and cover it. Place the dish in a dark area for three to eight weeks. 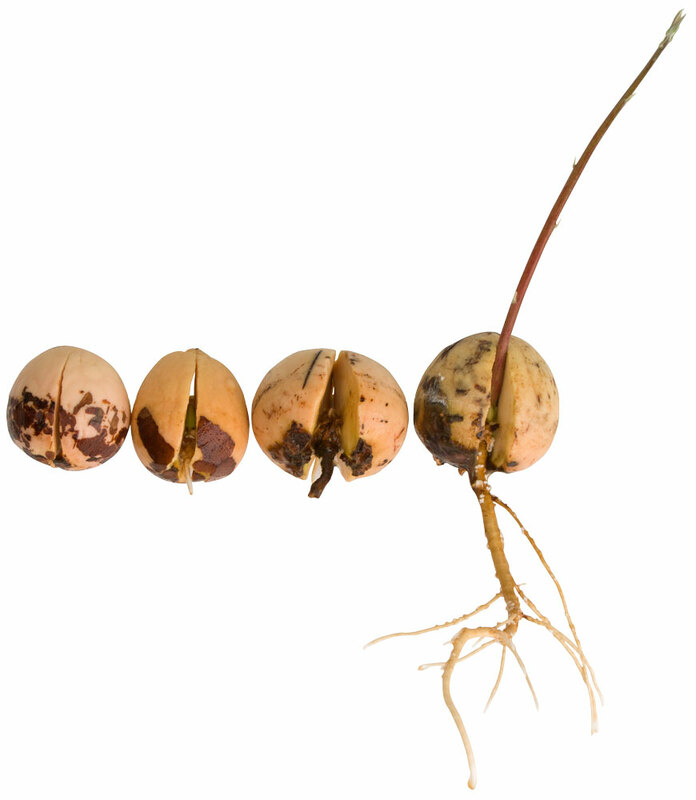 Observe your pit from time to time to check for germination. Also change the paper towel from time to time and make sure it is always wet. When the roots are about three inches the pit is ready for planting. AvoSeedo is an improved method of growing an avocado tree out of a pit. AvoSeedo is a small boat made of plastic that has an indentation with a hole in it and builds on the idea behind the toothpick method. How do I use AvoSeedo? After cleaning the pit insert it with the wide part facing down. Place the AvoSeedo in a large bucket filled with water. Because of its high displacement and low weight AvoSeedo will always remain at water surface; AvoSeedo will lower as the water level lowers. See how it works here. After 3 to 8 weeks the pit will start to germinate. 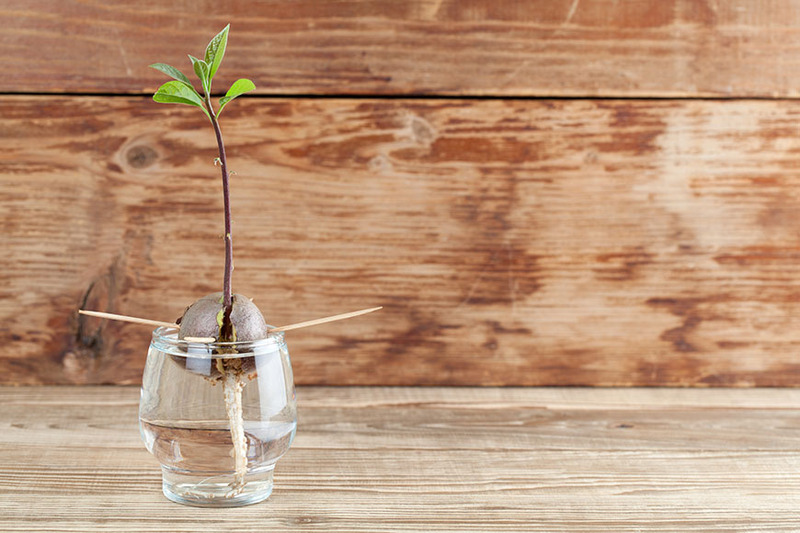 Like with the toothpick method the sprouted seed can be transported to a larger, permanent container as soon as the little tree has some leaves. And there you have it! You’re on your way to having your own avocado tree! Keep in mind that this is a long term commitment! It can be between 3 and 15 years before you’ll see any avocados. What does help is having several trees growing together as this aids in pollination. There is also no guarantee that your efforts will produce a tree that produces any avocados. What is nearly guaranteed, though, is that your efforts can offer you a sense of accomplishment and a new experience! How to select the best type of avocado to grow indoors Successfully growing avocados in a pot Dwarfing Avocados How to Care for Your Avocado Tree in the Winter A Brief History of the Avocado Avocado and Its Different Breeds DIY Avocado Hair Mask How Many Avocados Do You Need Per Week For Long Life? 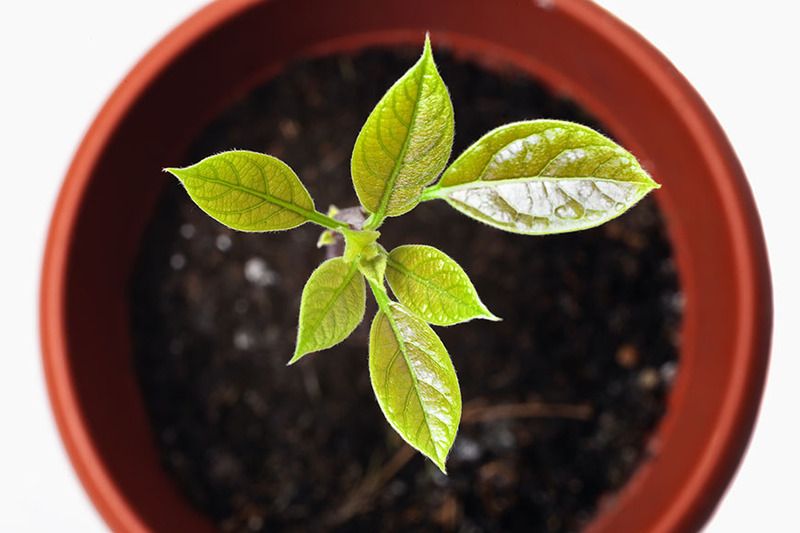 This entry was posted in All about Avocados, Gardening and tagged Avocado, avocado tree, avoseedo, compost, diy, germinate, germination, grow, grow avocado indoor, pit, plant pot, planting, rooting, roots, seed, soil, sprout, toothpick, wet towel.